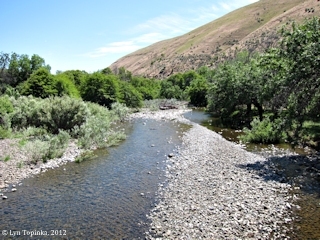 "Rock Creek, Washington ... (Klickitat County)"
Rock Creek is located in Klickitat County on the Washington side of the Columbia River at River Mile (RM) 229, in T3N R19E, Section 32. Seven miles upstream is the small orchard community of Sundale, and fifteen miles upstream is the larger community of Roosevelt. 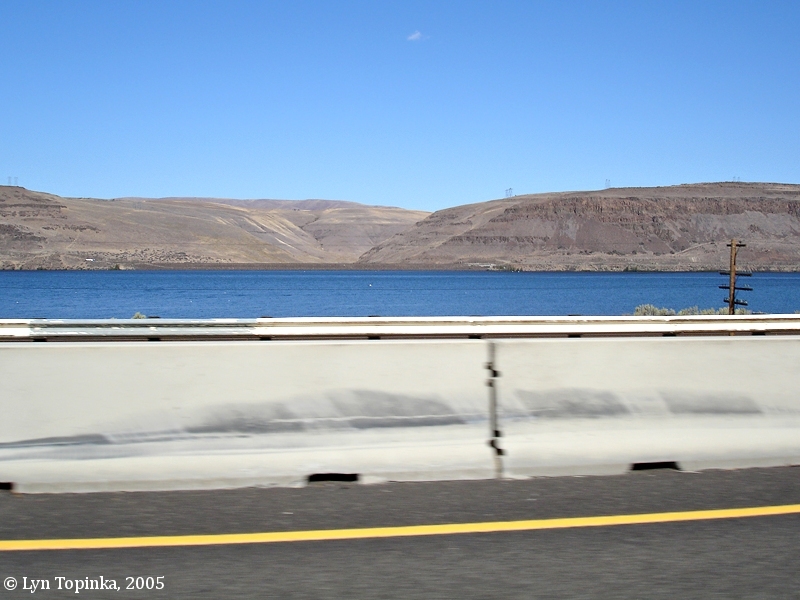 Downstream is the John Day Dam which spans the Columbia River at RM 216. Across the river on the Oregon side is a Quinton, Philippi Canyon, and the historical location of Blalock. Blalock once a train stop and small community but is now under the waters of Lake Umatilla, the reservoir behind the John Day Dam. The mouth of Rock Creek was also flooded by those waters. 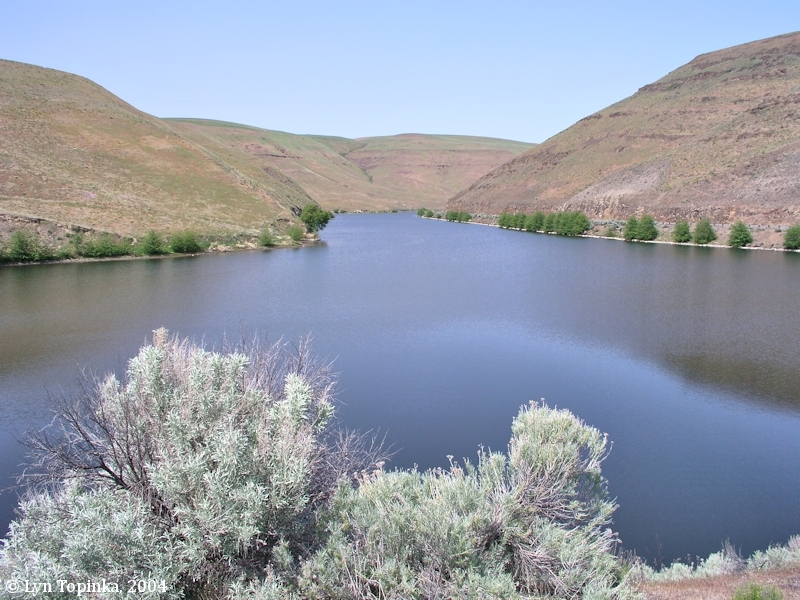 Lewis and Clark spent the night of April 23, 1806 camped on the banks of Rock Creek. 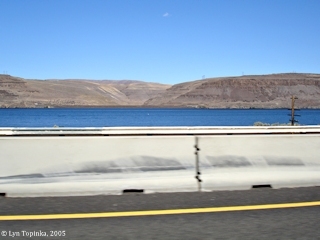 Click image to enlarge Rock Creek drainage, Washington, from Interstate 84, Oregon. View of Rock Creek Canyon, Washington, while driving along Interstate 84, Oregon. Thin horizontal lines are wires on the Oregon side. Image taken September 24, 2005. 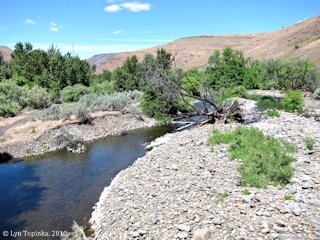 Lewis and Clark missed seeing Rock Creek on their journey downstream in 1805. They did notice it however on their return trip in April 1806 and they camped on Rock Creek's upstream (left) bank. Lewis and Clark's Campsite for April 23, 1806, was just upstream of Rock Creek, at a large Indian Village. Lewis and Clark's route map [Moulton, vol.1, map#77] shows the Indian village and Lewis and Clark's camp to be on the upstream side of Rock Creek. Rock Creek itself is unnamed and its mouth is located behind an island hugging the Washington shore. 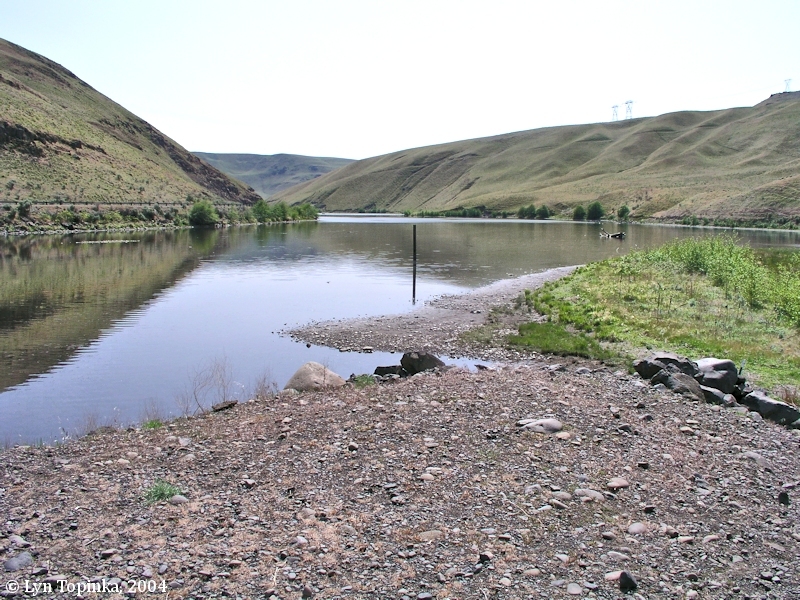 Their previous camp of April 22, 1806 was located upstream of the John Day Dam, across from the mouth of the John Day River. 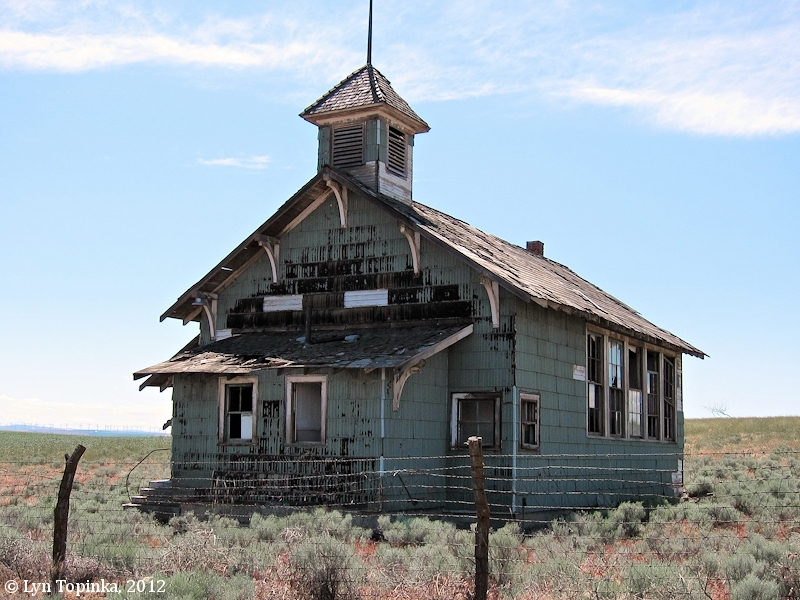 Their camp of April 24, 1806, was near Roosevelt, Washington. 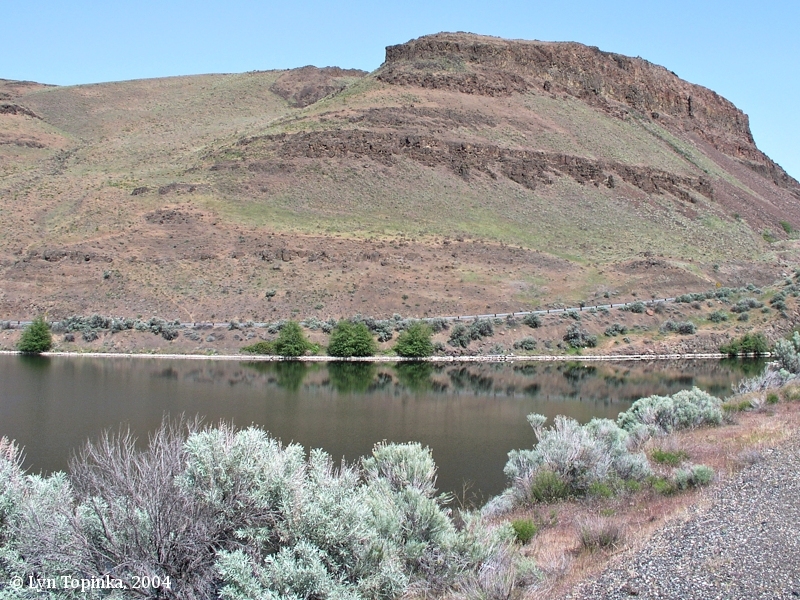 Click image to enlarge Rock Creek, Klickitat County, Washington, looking towards the Columbia River. Image taken April 24, 2004. Click image to enlarge Left bank of Rock Creek, Washington, near it's junction with the Columbia. 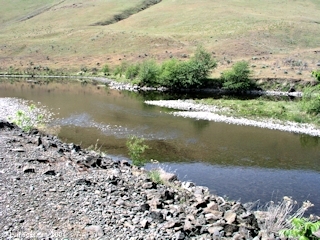 View from Washington State Highway 14 bridge crossing Rock Creek. Image taken April 24, 2004. Click image to enlarge Rock Creek, Washington. Rock Creek approximately one mile upstream from the Columbia River, where the the backwater from Lake Umatilla (the reservoir behind the John Day Dam) ends and Rock Creek begins. View from the boat launch/picnic area. Image taken April 24, 2004. Click image to enlarge At Rock Creek Picnic Area and Boat Launch. Image taken April 24, 2004. 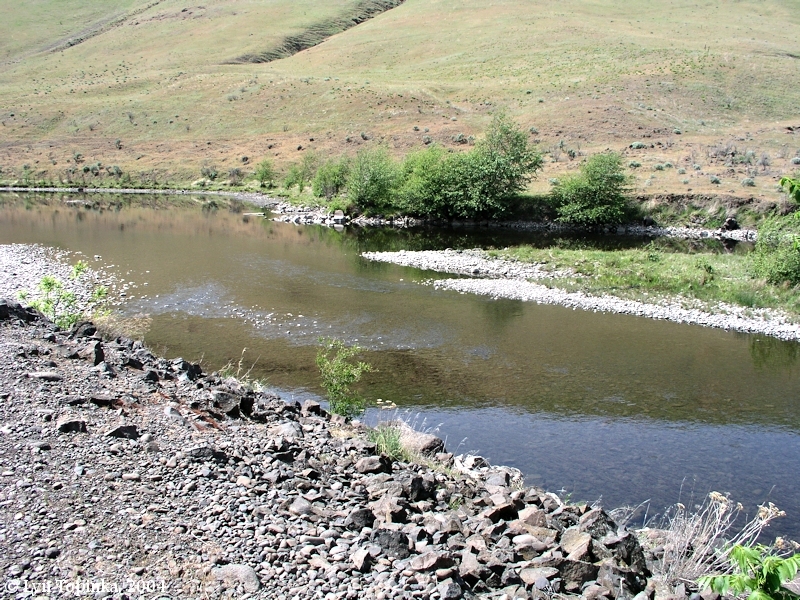 Click image to enlarge Looking upstream Rock Creek, Klickitat County, Washington. View from bridge approximately four miles upstream from the junction with the Columbia River. Image taken June 6, 2012. Click image to enlarge Looking downstream Rock Creek, Klickitat County, Washington. View from bridge approximately four miles upstream from the junction with the Columbia River. 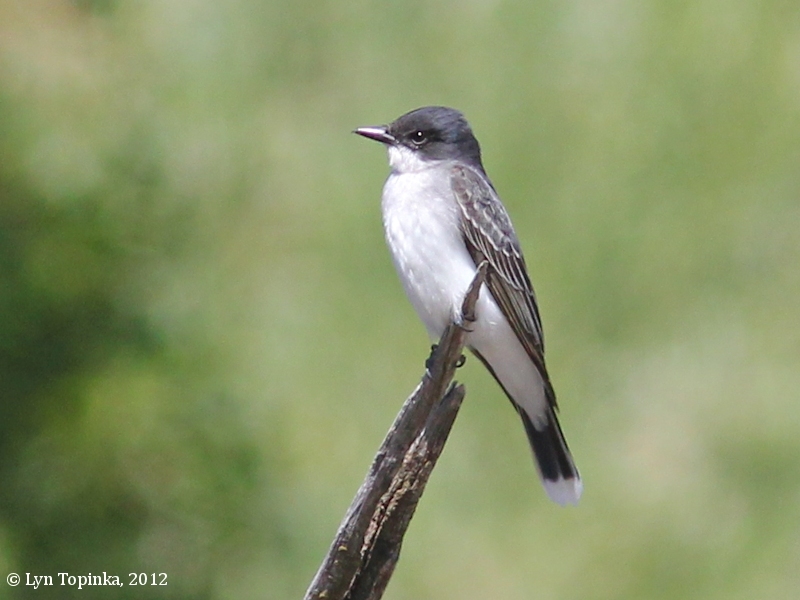 Image taken June 6, 2012. 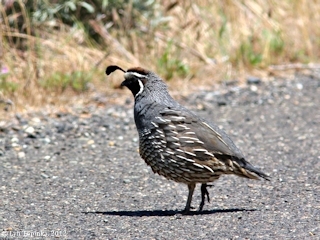 Click image to enlarge California Quail, male, Rock Creek, Klickitat County, Washington. Image taken June 6, 2012. Click image to enlarge Bullock's Oriole, male, Rock Creek, Klickitat County, Washington. 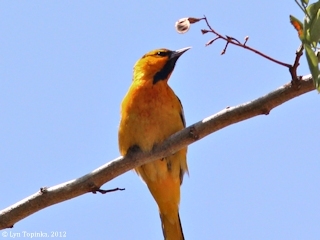 Image taken June 6, 2012. Click image to enlarge Eastern Kingbird, Rock Creek, Klickitat County, Washington. 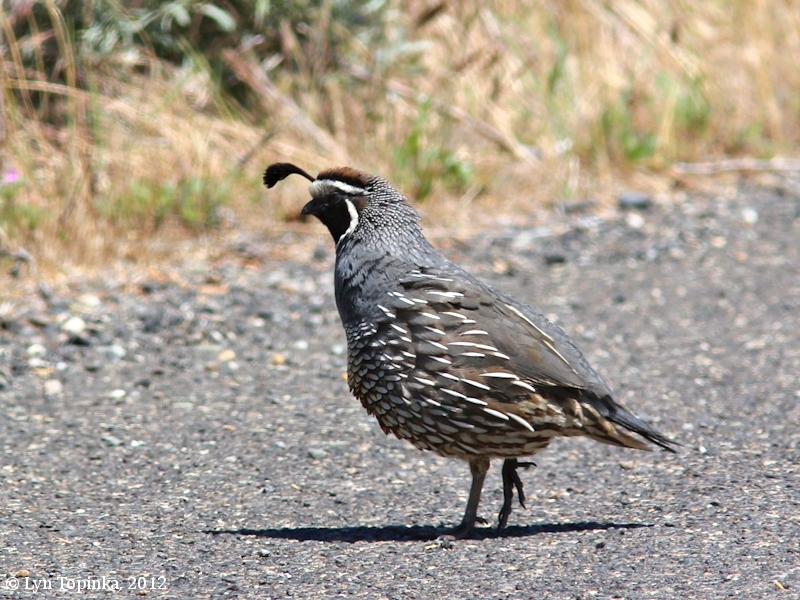 Image taken June 6, 2012. The Goodnoe Hills rise up from the right bank of Rock Creek. 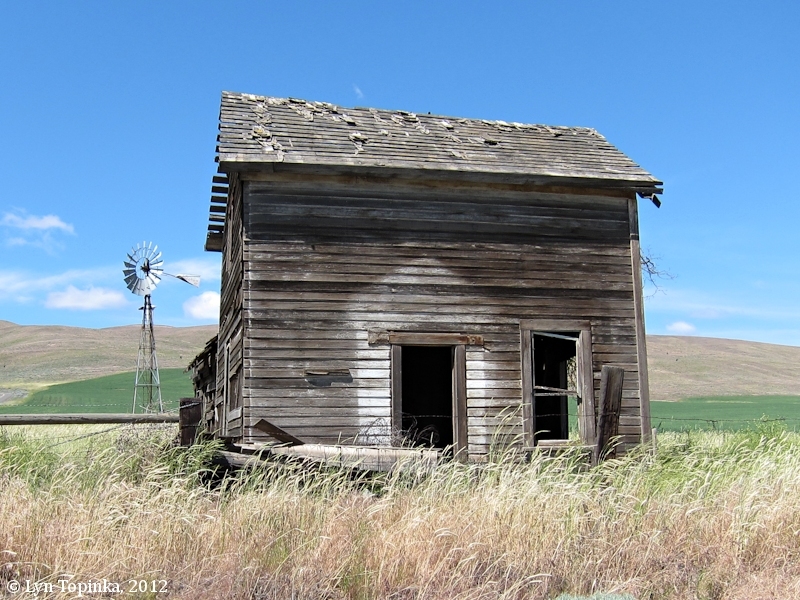 The Goodnoe hills are a part of the more massive Columbia Hills which stretch across Klickitat County from the Klickitat River on the west to Rock Creek on the east. A verry cool morning wind from the S. W. we Set out verry early and proceeded on, last night [their previous camp was downstream of Roosevelt, Washington] we could not Collect more dry willows the only fuel, than was barely Suffient to cook Supper, and not a Sufficency to cook brackfast this morning, passd. a Small Island at 5½ miles a large one 8 miles in the middle of the river, Some rapid water at the head and Eight Lodges of nativs opposit its Lower point on the Stard. Side, we came too at those lodges, bought some wood and brackfast. ... at 2 miles lower passed a rapid, large rocks Stringing into the river of large Size [near Blalock Canyon], opposit to this rapid on the Stard. Shore is Situated two Lodges of the nativs drying fish here we halted a fiew minits to examine the rapid before we entered it which was our constant Custom, and at all that was verry dangerous put out all who could not Swim to walk around, after passing this rapid we proceeded on passed anoothe rapid at 5 miles lower down, above this rapid on <the Stard. Side> five Lodges of Indians fishing &c. [near Rock Creek where they would camp on their return, on April 23, 1806] above this rapid maney large rocks on each Side at Some distance from Shore, one mile passed an Island Close to the Stard. Side, below which is two Lodge of nativs, a little below is a bad rapid which is bad crouded with hugh rocks Scattered in every Direction which renders the pasage verry Difficuelt a little above this rapid on the Lard. Side emence piles of rocks appears as if Sliped from the Clifts under which they lay passed great number of rocks in every direction Scattered in the river 5 Lodges a little below on the Stard. Side, and one lodge on an Island near the Stard. Shore opposit to which is a verry bad rapid, thro which we found much dificuelty in passing, the river is Crouded with rocks in every direction, after Passing this dificult rapid to the mouth of a Small river on the Larboard Side [John Day River] 40 yards wide descharges but little water at this time, and appears to take its Sourse in the Open plains to the S. E. from this place I proceved Some fiew Small pines on the tops of the high hills and bushes in the hollars. 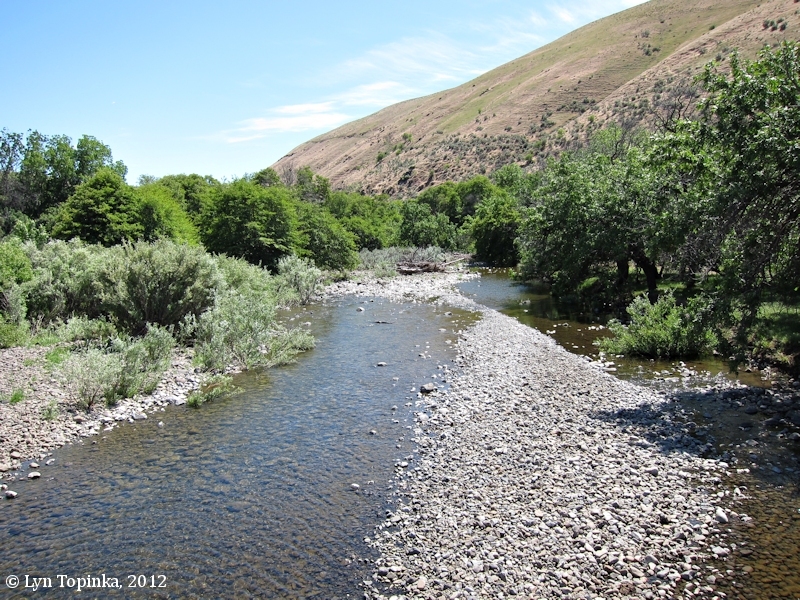 imediately above & below this little river [John Day River] comences a rapid which is crouded with large rocks in every direction, the pasage both crooked and dificuelt, we halted at a Lodge to examine those noumerous islands of rock which apd. to extend maney miles below,—. great numbs. of Indians came in canoes to View us at this place, after passing this rapid which we accomplished without loss; <we passed> winding through between the hugh rocks for about 2 miles—. (from this rapid the Conocil mountain [Mount Hood] is S. W. which the Indians inform me is not far to the left of the great falls; this I call the Timm or falls mountain it is high and the top is covered with Snow) imediately below the last rapids there is four Lodges of Indians on the Stard. Side, proceeded on about two miles lower and landed and encamped near five Lodges of nativs, drying fish [Washington side just downstream of today's John Day Dam] those are the relations of those at the Great falls [Celilo Falls], ... this part of the river is furnished with fine Springs which either rise high up the Sides of the hills or on the bottom near the river and run into the river. the hills are high and rugid a fiew scattering trees to be Seen on them either Small pine or Scrubey white oke. ... we made 33 miles to day. at day light this morning [camp across from the John Day River] we were informed that the two horses of our interpreter Shabono were missing ... as our Situation was Such that we Could not detain for a horse, which would prevent our makeing a timely Stage which is a great object with us in those open plains, we Concluded to give up the horse and proceed on to the next village which we were informed was at Some distance and would take us the greater part of the day. 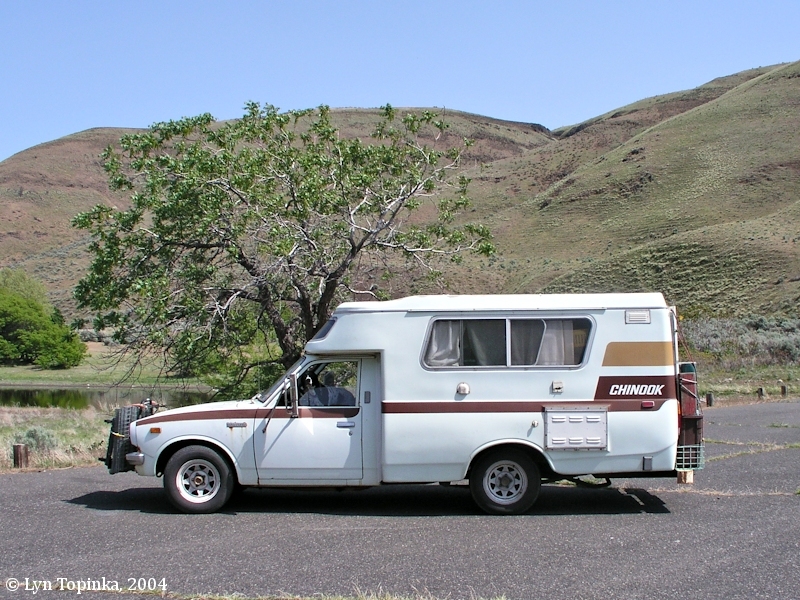 at 11 A. M. we packed up and Set out and proceeded up on the N. Side of the Columbia on a high narrow bottom and rockey for 12 miles to the Wah-how-pum village near the rock rapid [Rock Creek Rapids] of 12 temporary mat Lodges, those people appeared pleased to See us. ... we passed Several Lodges on the bank of the river where they were fixed waiting for the Salmon. ... at this village a large Creek falls in on the N. Side which I had not observed as I decended the river [Rock Creek]. the river is by no means as rapid as it was at the time we decended. ... The Sand through which we walked to day is So light that renders the march verry fatigueing. made 12 miles by land.